What I Played this Week - Green Rage and Battle Fleet! Ok, so let's start with Battle Fleet. I doubt there are many who have not experienced the game of Battleship. You and an opponent sqaure off over a double grid of ship icons, each hidden from the other's view. Each player takes turns launching virtual salvos at the other's hidden ship layout, and so on, et cetera until someone sinks the opponent's game pieces. 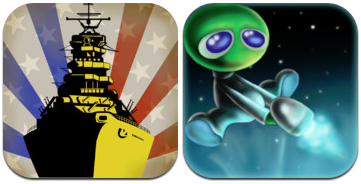 Bship is a blast (see my iOS battleship review here), but always left me feeling kind of unfulfilled. The ships can't move during combat--unless you lie or cheat, and c'mon..who hasn't tried that a few times? Funny when your opponent knows he just got a hit, and you say nothing, heehee. Yelling out bingo numbers does grow a bit tiresome after several thousand plays, however. Battle Fleet is the game you envisioned Battleship could be if there were iPads and similarly cool stuff in the 70s and 80s. Not only do the ships move under your command, but they have an array of weapons to bring to bear on the enemy. Though Fleet is turned-based like Bship, it's a much much more dynamic game. What I like about both games in this review is that indie developers created very good games that aren't over the top complex or filled full of mind-blowing graphics, though I must say that the sound, game scenes and overall ambiance of Green Rage are remarkable. Battle Fleet uses very generic-looking graphics, which really do not effect the fun or playability of the game in the least. The simple icons add to the somewhat nostalgic feel of the game, in my opinion. The startup offers a tutorial (which I embarrasingly lost to the computer AI several times). When you first go through it, you get a taste for what it would be like to command a range of fleet weapons, and it is not easy. The strategem or theme in Battle Fleet is pretty straight-forward: tactical naval warfare methods and physics (complete with animations of your shots). It actually reminds me a bit of Scorched Earth 3-D, but on the ocean of course (where else would ships fight, duh)? In BF, you and a computer AI enemy, (or a human if you prefer) go head to head. There are several game modes to choose from including a hotseat mode that puts each turn on a timer (called "no kibitzing" mode to Scorched Earth 3D fans). You begin with your respective fleets miles apart. You then try to close with and destroy the enemy in detail, meaning you actually drive and control the individual ships. There are a variety of weapons to mount on your ships (torpedoes, precision guns, area and defence weapons). Carriers are probably the most ferocious, as they allow remote and semi-precise bombing of the enemy on every turn. Each weapons hit will cause a certain amount of damage to the enemy vessel, but not total destruction. Even a crippled ship can still have teeth, and yes, you can damage yourself by running your ships together (uh, been there, done that). Hot Seat was probably my favorite mode of play, as it really ratchets up the pressure and excitement of closing and killing the enemy ships on each turn. I smashed the arm of my chair when I missed, and fist-pumped when I got a hit. I started thinking ahead like a naval battle chess player, and was nearly ready to volunteer as a part-time U.S. Navy Admiral when my frigate and main battleship were destroyed. The features in this game are varied and authentic, recalling the greatest of sea battles between U.S. and Japanese forces in WW2, even including Japanese computer voice responses (kind of a neat touch). You can also battle against opponents over the internet. If you want to get a whiff of the experience of commanding a fleet in the Pacific in a naval battle, this is your game. It played just fine even on my old iPad 1 without incident and is a mere 40M or so in size. UPDATE: 11/05/2012--I always try to be fair in product reviews, but I will be honest that I like to give app vendors the benefit of the doubt. Coders work hard to make software products like Green Rage, that are not only fun but artistically unique. I have banged out a few lines of code in my day (chock full of bugs), and though I don't do much more than script stuff today, I know the hard work that goes into making excellent software. Developers are a big part of the reason Apple is such a success with iOS, so I especially salute a vendor who proactively decides to pull/fix a product. Until further notice, the vendor has decided to pull the product due to early complaints from users, similar to those noted below in my review. I still feel the game has a huge amount of potential for success, so stand by my opinion that it is a good game, however enough user complaints convinced the developer to work on it some more. I applaud that decision, but wanted to let our readers know. The vendor informed me that Green Rage will return to the App store in the future, and I will cover it when it does. Green Rage is one of the oddest looking platform games I have played, and really the scenes, backgrounds, and animations are all just fabulous, though the nice graphics do bring the game in at a somewhat heavy 200+M. Music is a little repetitive, but also matches the game's weirdness well. The detailed world is well-done, and this is the kind I enjoy probably more than traditional run/jump platform games. For one, the little guy you control doesn't really run very fast. He instead kind of shuffles along. He can jump, but that is the only other action move he can do. Holding the jump button will make him jump higher. Ok, so what's so different then, you ask? He has a blaster! And in this world (which reminds me of a sort of "junkyard planet", I guess) you need the blaster, because all kinds of critters are coming to pick at and kill you. Mostly from the air... and several at once, so the game is quite hard in more than a few spots. Oh, almost forgot... You also have like a force field/respawn point--another unique feature, in that when you activate it, you set the point that your next play will respawn. Pretty nifty concept, and it will also provide some protection from the bad guys. The terrain, obstacles and enemies are similarly varied and unique. Some things crawl at you, or fly. Others are objects to avoid in your path. Killing the baddies and collecting the power-ups though will upgrade the hand cannon to bigger and better models, so you want to kill as many as possible. I thought the D-Pad and control layouts were a little weird. I moved them around and that helped some. When firing, you must use the left d-pad to control angle, which also take a bit of getting used to. The game starts with a sort of navigate-able backstory, which confused me for a full minute. At first I thought it was the level selection screen or something. I kept tapping stuff on the screen to no effect. I figured out it was the intro to the game's story when I finally noted the arrow icons at the bottom, which you must navigate through on each level (a little annoying, but not required once complete). Evidently your character get's in some trouble with his space commander, and get's kicked (literally by a boot going up into his rump) off the planet through a worm hole to land headfirst on the junkyard world. I guess he is trying to survive to get back or something. The backstory never much matters to me in platform games, but there it is. I thought it was his Dad, and he was a space alien kid, but the developer gave me the scoop that it's his commander handing down the punishment. Anyway, I like Green Rage, if only for the shuffly little alien and his stunning quick-on-the-draw blaster. The ambience of the game is striking, and is one of those games worthy of a try, but alas there were a few technical challenges to report. It did crash on my iPod touch 4G several times even after a reset. On iPad 1, the game is not playable as the character is just a black square. I informed the developer and they are looking into the crashes, but be advised they are only supporting newer devices, so this game is not likely to work well on older iOS hardware and OS versions. The game also did not seem to stay in cache when I tried multi-tasking to other apps, and also no Game Center or OpenFeint support at this time.